Chevrolet was a little slow jumping on the V8 bandwagon after World War II. Ford offered its first V8 back in 1932 – a flathead V8. It was the 1955 model year when Chevrolet released its first V8 in many years the small-block 265 cubic-inch OHV V8 (Chevrolet’s first V8 was the Series D V8 which was only produced for the 1918 model year). The engine was a mega success and many different forms were offered of this V8 in different displacements for the next several decades. Chevrolet released its first big-block V8 engine in 1958 referred to at the time as the W-series V8, it become known as Chevrolet’s Mark I big-block V8. It was available in both Chevrolet’s car and truck lineup starting in 1958. Displacement was 348 cubic inches which was 65 cubic inches more than Chevrolet’s small-block V8 for 1958 which displaced 283 cubic-inches. However the W-series would have probably fell into obscurity had it now been for the release of the 409 cubic-inch version of the W-series in 1961 called the 409. The 409 was the result of taking the 348 V8 and increasing its 4.125 inch bore to a very large 4.312 inch bore and increasing the 348’s 3.25 inch stroke to a 3.50 inch stroke. 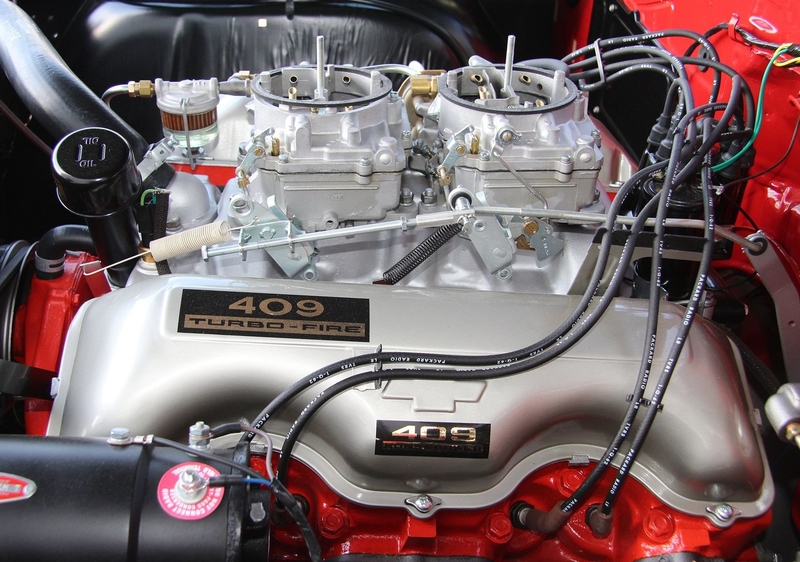 The center-to-center spacing of the 348 and 409 engine blocks is the same 4.84 inches of Chevrolet’s Mark IV big-block V8 which eventually replaced the W-series V8 during the 1965 model year. The 409 had forged aluminum pistons which was a nice upgrade from the 348’s more run-of-the-mill aluminum pistons. The 348 and 409 unlike many of the V8s of their day which had bowl type combustion chambers, had wedge shaped combustion chambers. To obtain the wedge design Chevrolet gave the block deck a unique 74-degree angle. Another unique aspect to the 348 and 409 was they had offset valves whereas most V8s in their day had valves lined up in a single row. This is the reason why the 348 and 409 both had very unique valve covers that had rounded curves at the bottom. Because of this a 348 and 409 are very easily identified when compared to other V8 engines. The 409 was first released in the middle of the 1961 model year in Chevrolet’s full-size car models – the Biscayne, Bel Air, and Impala. It had a 11.25:1 compression ratio and produced 360 horsepower and 409 lb-ft of torque and it had a single Carter 4-barrel carburetor. During the 1961 model year Chevrolet also debuted a new performance oriented version of its full-size Chevrolet called the Impala SS which was short for Impala Super Sport. Even though the Impala SS was available with different Chevrolet V8 engine offerings for 1961, the 409 powered Impala SS was one the most revered full-size performance cars in the U.S. market. The SS version of the Impala had the sporty looks and when optioned with the 409 V8, it had one of the best high-performance engines available at the time. 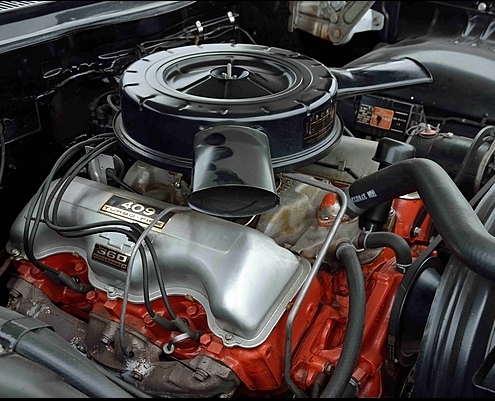 For 1962 the 4-barrel 409 jumped up to 380 horsepower and 420 lb-ft of torque and its compression ratio dropped to 11.0:1. However it was a new 409 V8 offering with dual 4-barrel Carter AFB carburetors for 1962 that gave the 409 legendary status, it produced 409 horsepower and 420 lb-ft of torque and also had a compression ratio of 11.0. This was a big milestone for Chevrolet since horsepower output was 1 horsepower per cubic-inch which which was the ultimate achievement for production performance engines at the time. It was the Summer of 1962 when the Beach Boys released their legendary song “409” which made the 1962 dual 4-barrel 409 an instant legend. 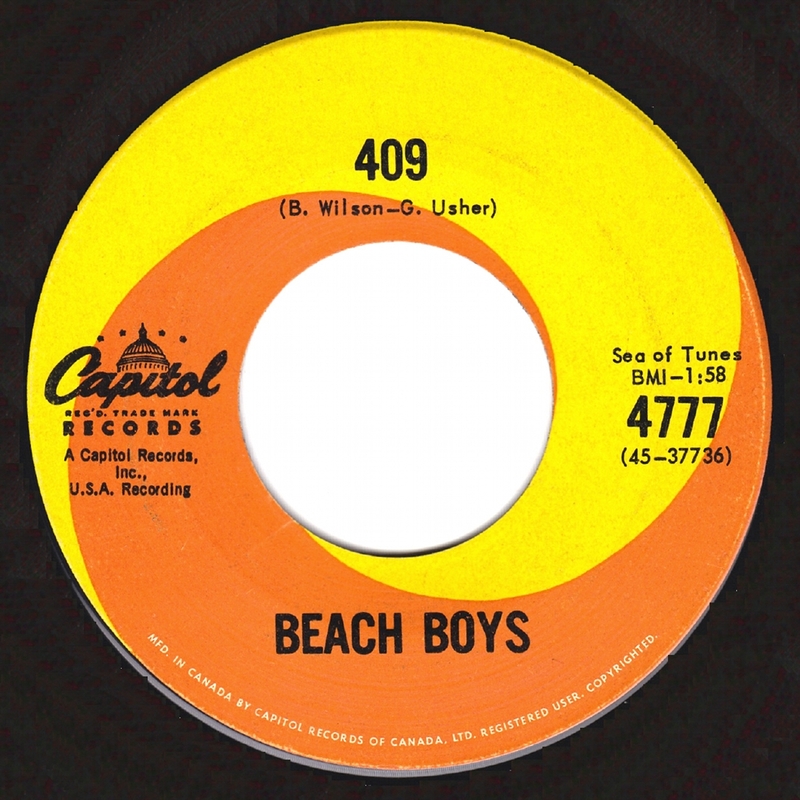 With this song the Beach Boys introduced the performance car lingo to America’s youth with lyrics such as “My four speed dual quad posi-traction 409”. Motor Trend magazine back in the day with a 409 horsepower 409 V8 and 4-speed manual equipped 1962 Impala SS obtained 6.3 seconds from 0-60 mph and 14.9 seconds at 98 mph. For 1963 there were two offerings of the single 4-barrel 409 V8. First was a 10.0:1 compression ratio version rated at 340 horsepower and 420 lb-ft of torque, second was 11.0:1 compression ratio version rated at 400 horsepower and 425 lb-ft of torque. The 409 with dual 4-barrel carburetors was back again for 1963 with a slight power increase to 425 horsepower and 425 lb-ft of torque. All three of the 409 V8 offerings carried over to 1964 unchanged with the same horsepower and torque ratings. 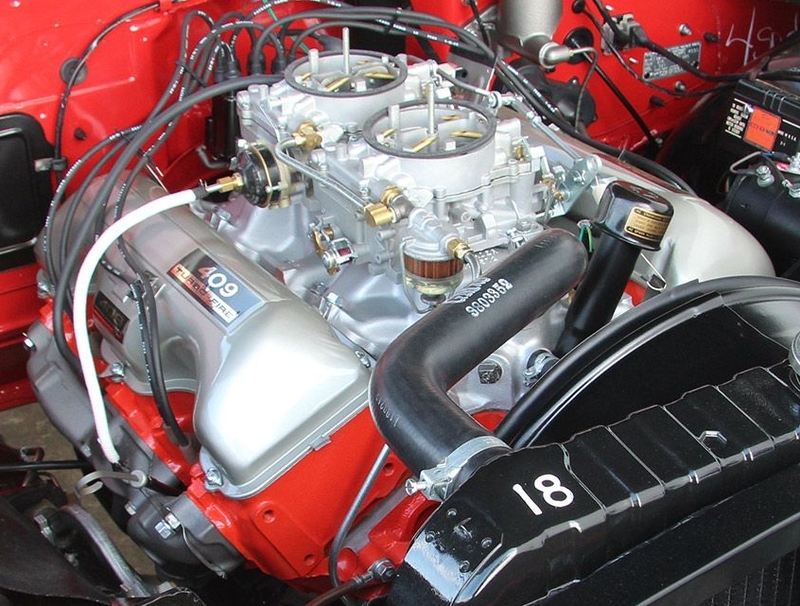 All 1964 409 engine offerings carried over to the 1965 model year except for the 409 with dual 4-barrel carburetors, it was not available for 1965. The Mark IV big-block 396 cubic-inch V8 replaced these two 409 V8s during the middle of the 1965 model year. There were also versions of the 409 V8 that powered Chevrolet’s large trucks during this time period. And there was a 427 cubic-inch version of the W-series big block called the Z11, not to be confused with the later Mark IV big-block 427. The Z11 427 had the same bore as the 409 but the stroke was increased to 3.65 inches. 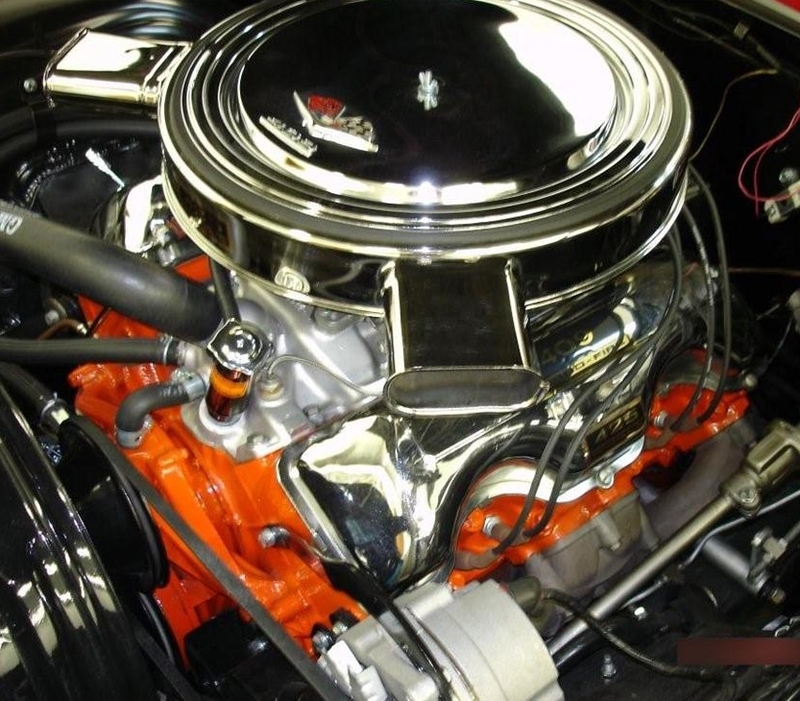 Though the Z11 427 had a 13.5:1 compression ratio, it did make it into a very small number of full-size production 1963 Chevrolets which were sold at Chevrolet dealerships, it was a engine that was intended for NASCAR and NHRA race use. As previously mentioned the 409 in the middle of the 1965 model year was replaced by the Mark IV 396 cubic-inch big-block V8, for 1966 the Mark IV 427 cubic-inch V8 would be released and by 1970 it would reach 454 cubic-inches. Even so the 409 V8 hasn’t been forgotten. Why is the 409 such an important part of automotive history? It made Chevrolet’s full-size cars – the Biscayne, Bel Air, and Impala models which were budget oriented family cars into revered high performance cars. The appeal was simple, a customer who bought a 409 V8 equipped Chevrolet got a lot of performance for the money. Even those with a modest income could afford one. Compare this to the Corvette which also gave fantastic performance at the time but was out of reach of most buyers’ budgets. There would have probably never been a 389 cubic-inch V8 equipped 1964 GTO or a muscle car era thereafter, if it had not been for the popularity of the 409. To get an appreciation of how easily affordable ordering the 409 option was back in the day, the legendary 409 horsepower 1962 409 V8 engine option had a sticker price of around $376. All performance car fans owe a debt of gratitude to the 409 V8.